2019 is an important year of anniversaries for Manchester, and it’s natural that the long echo of Peterloo should ring the loudest in this bicentenary year. For all of us here at Chetham’s Library, it will be remembered as a year of sad loss. Last Friday saw the funeral of our Librarian of thirty-five years, Michael Powell, and with it the end of an era of his untiring custodianship of the Library and its collections. In this time Michael oversaw the creation of the first complete single catalogue of the printed collections, a completely new catalogue of the archives and manuscripts, the rescue of the Library’s finances (a never ending task! ), and the advancement of both scholarship and popular use and understanding of the Library through thousands of reader visits, study groups, book launches, arts collaborations and much more. 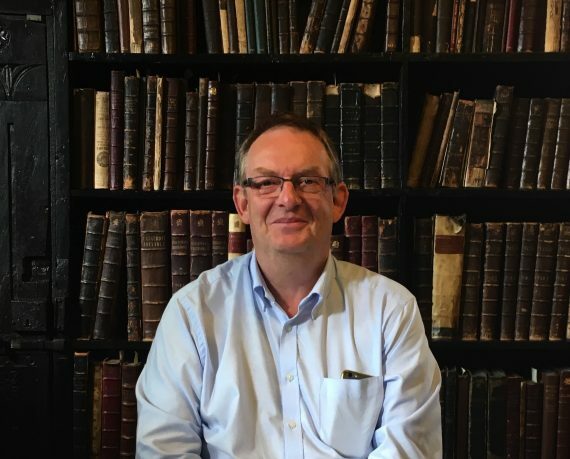 Printing and printing history were abiding interests for Michael, and he was keen that 2019 be remembered as the tercentenary (300- year anniversary) of the first book to be printed in Manchester. That book was Mathematical Lectures, printed in 1719. An otherwise unremarkable object, its publication was motivated by a desire to commemorate the mathematician, John Jackson: the editors write that, ‘We thought it wou’d be great Pity, as well as Ingratitude, to let such worthy Performances expire with him’, ‘the late Ingenious […] Mr. John Jackson’. It is coincidental that this book, whose significance in Manchester’s history has grown in time, should now be one (of many) by which we remember our own, late Librarian. Manchester did not come early to printing, but this slim maths volume was to be the harbinger of an immense printing industry, centring on newspaper production, that would eclipse all other cities but London. 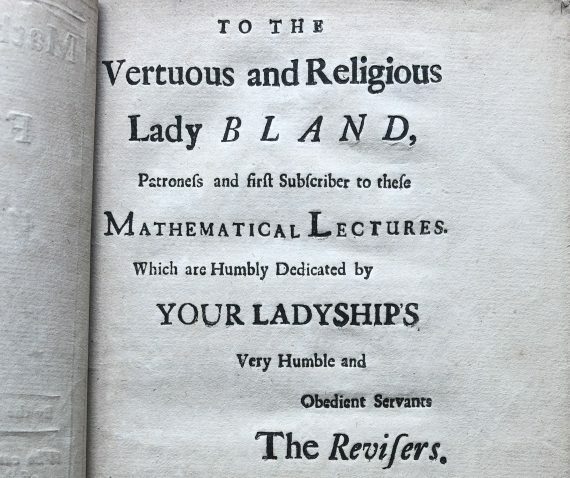 Mathematical Lectures is dedicated to ‘the Vertuous and Religious Lady Bland’, who was the patroness and first subscriber to the series. Lady Ann Bland was the daughter of Sir Edward Mosley and inherited the manor of Manchester in 1693. (She also provided funds for the new St Ann’s Church, consecrated in 1712). But while Mathematical Lectures begins with a dedication to this influential woman, the lecture itself is addressed, somewhat inevitably for the age, to the ‘Gentlemen’ of the society. The following piece, inspired by Mathematical Lectures, was originally written for the blog in 2013 by our collections volunteer, Patti Collins. In turn, Michael’s presence can be detected in the ‘we’ to which Patti refers; and if you knew him, it is not difficult to imagine Michael, with his deep knowledge of the Library and verve for bringing its collections to life, engaged in the telling of this story and bringing down books from the shelves. So, whether in memory of Michael or simply in the spirit of curiosity which is his legacy here, please read on. 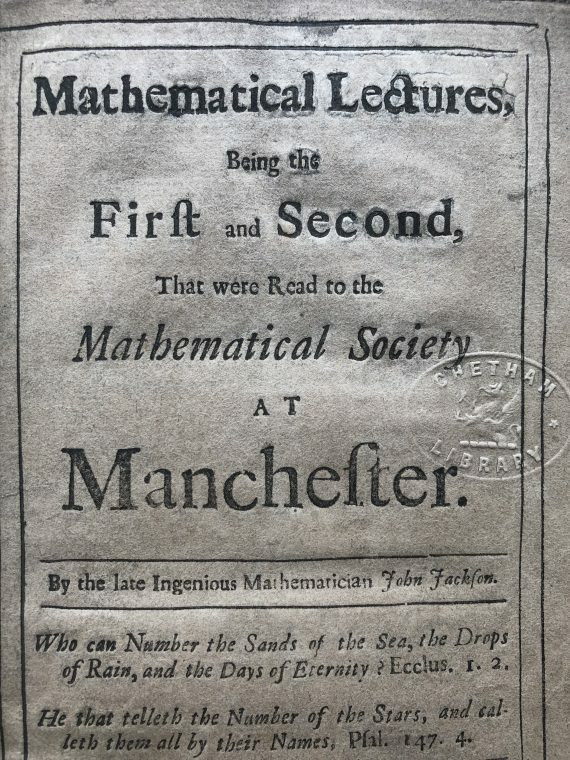 Rather surprisingly, the first book ever published in Manchester was a mathematics book, Mathematical Lectures: being the first and second that were read to the Mathematical Society at Manchester. By the late ingenious John Jackson. Printed by Roger Adams in the Parsonage, and sold by William Clayton, Bookseller at the Conduit, 1719. 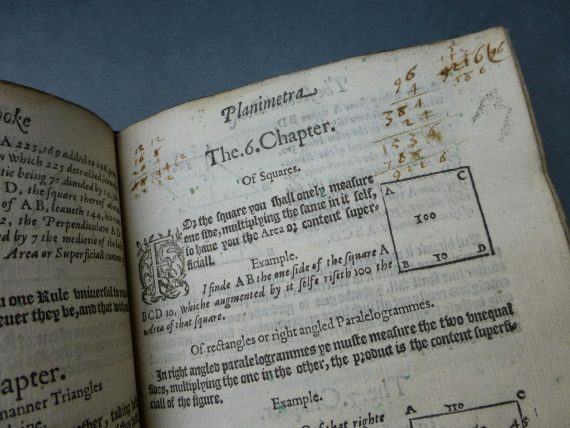 Little is known about the ‘late, ingenious John Jackson’, but we have been inspired to investigate some of the other mathematical books in Library’s collection and, taking the idea of ‘Six Degrees of Separation’, to see if we can connect them. 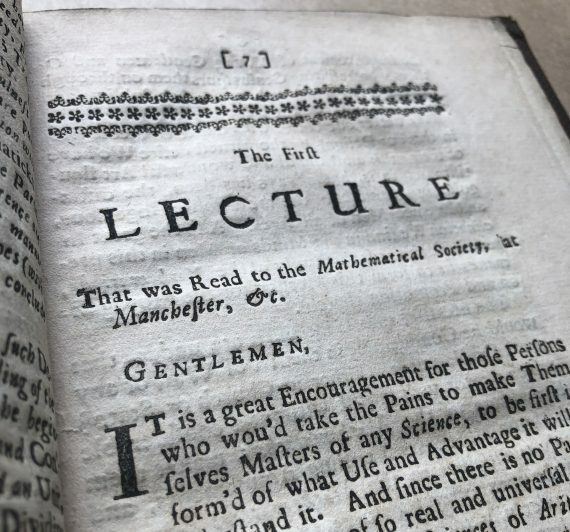 Firstly, there is a historical link between Mathematical Lectures and Chetham’s Library, through William Clayton, the bookseller named on the title page. His son, John, was ordained and became perpetual curate of Sacred Trinity Church Salford in 1733. He also became a fellow of Manchester Collegiate Church (now Manchester Cathedral) in 1760, and a feoffee of Chetham’s Hospital and Library in 1764. Undoubtably the most famous mathematician to be connected to Chetham’s Library (and probably its most famous resident) is Dr John Dee (1527-1609) – not only a mathematician but also a philosopher, alchemist and astrologer, who was appointed warden of the college at Manchester in 1595. Illustrated below is The elements of geometrie of the most auncient phiosopher Euclide of Megara. Faithfully (now first) translated into the English toung by H. Billingsley… with a very fruitfull praeface made by M.I.Dee [John Dee]… 1570. Dr Dee provides the connection with three other mathematical books. The first two are by father and son, Leonard and Thomas Digges. 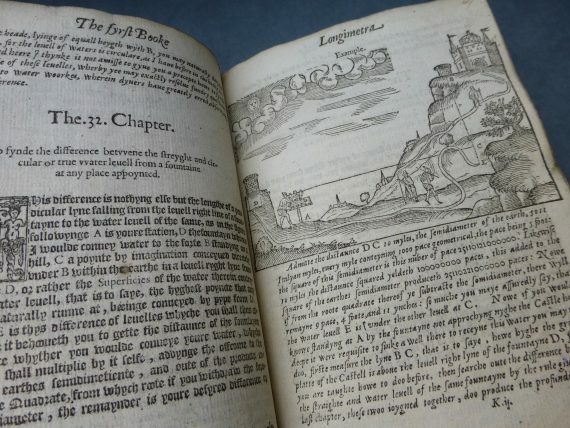 Leonard Digges’s book, Tectonicon (1556) was advertised as a book for surveyors, landmeters, joiners,carpenters and masons, ‘briefly shewynge the exacte measurynge, and speady redkenynge all maner lande, squared tymber, stone, steaples, pyllers, globes etc’. When Leonard died, John Dee became mentor and teacher to Thomas and referred to him as ‘my most worthy mathematical heir’. 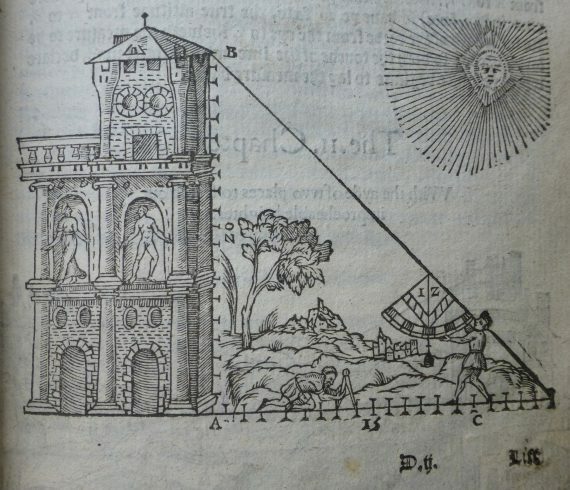 Thomas Digges completed and published his father’s second book Pantometria (1571) including with it a work of his own about geometry. The book promises ‘rules manifolde for mensuration of all lines, superficies and solides’. The ground of arts: teaching the perfect work and practise of arithmetick, both in whole numbers and fractions… made by M.Robert Record, D in physick. Afterward, augmented by M.John Dee. The Chetham’s Library copy dates from 1646, the much later date indicating that the book became a bestseller: it eventually ran to at least forty-five editions. There are some manuscript inscriptions in the front of our copy of The ground of arts. 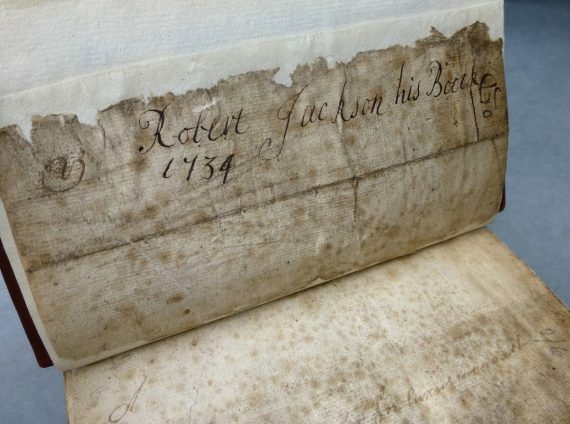 The clearest (pictured above) is an ownership inscription, reads ‘Robert Jackson his boock 1734’ (Robert Jackson’s book, 1734). A further inscription reads, ‘October John Jackson D D December Januwary the first September’. Given the mathematical and local connections, we wonder if this later ‘John Jackson’ is a descendant of his namesake, the ‘late, ingenious John’. …Perhaps? Thank you for this article. I am sorry to read of the death of Mr Powell. 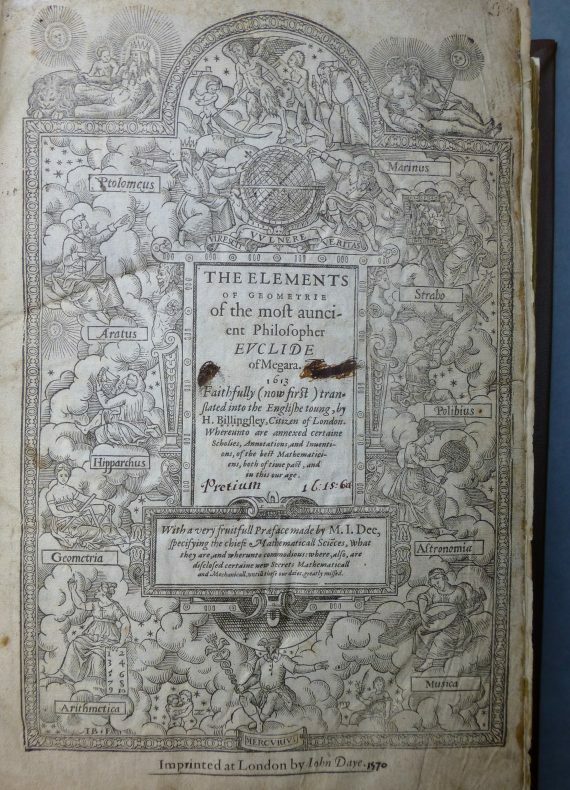 I visited the library to view Billingsley’s version of Euclid’s Elements. Most striking about this book is John Dee’s preface in which, amongst his review of applications of maths, he breaks his narrative to condemn those accusing him of sorcery. The book is also remarkable for being, in part, a pop-up book with 3-D versions of various solids. 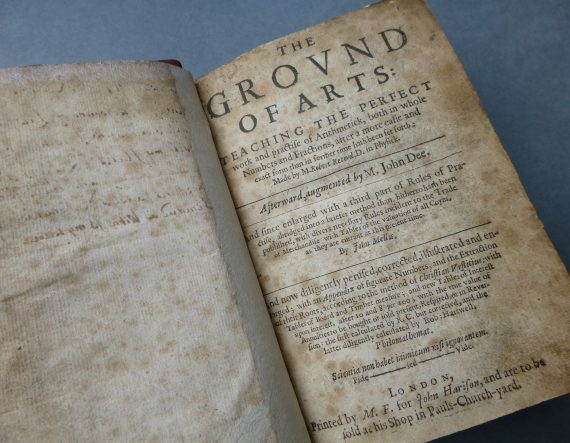 I have also viewed a copy of Robert Recorde’s A Ground of Artes in the John Rylands. I love the piece of dialogue in which the student says about arithmetic, “and some call it arsemetric “. My interest in these works is as a past producer of an Open University TV series on the history of maths. I hope to visit again at some time in the future to view more of your mathematical collection. Dear Andrew, thanks for you kind thoughts and words about Michael, we are all missing him. He would have been amused about the pop-up book – thank goodness they stopped at pop-up solids and didn’t try for liquids or gases.